iPad me-too: an iPad Mini to stop the iBleeding? 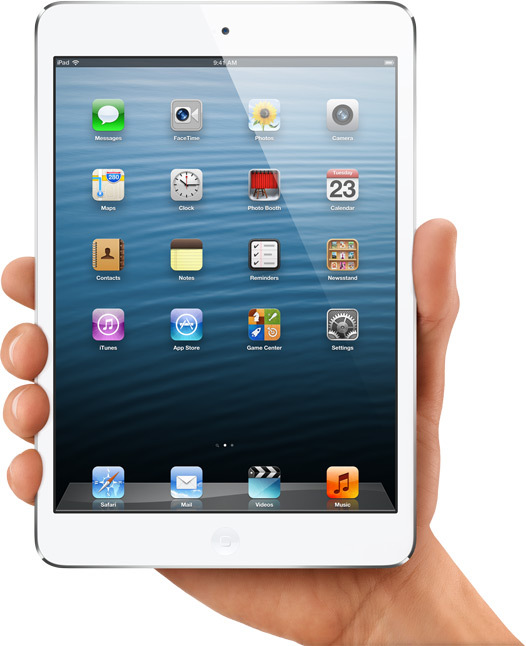 With the iPad Mini, Apple catches up with rivals Samsung (Galaxy Tab 7.7), Google (Google Nexus 7), Amazon (Kindle Fire, also 7 inch screen), or Barnes & Noble (Nook, also 7 inch). As usual, connectivity comes second: WiFi enabled devices arrive before the 3-4G gizmos (TTM not specified for LTE). At least, iPad mini is released before the Microsoft Surface 7 inch, for a good reason: it has not even been announced yet. So Tim Cook is mocking at Microsoft, a company from the past. Steve Jobs was mocking at 7 inch tablets not so long ago, but that was a time when Apple was well ahead of the pack. According to Strategy Analytics, Android claimed 41% of the tablet market on Q3 2012, up from 29.2% one year earlier, while Apple iOS dropped from 64.5 to 56.7%. Actually both are much lower, since some players don't disclose their sales figures, most notably Amazon, who will probably open up sooner or later anyway: Amazon is about distribution, not into OS. Launching iPad Mini looks more defensive than proactive. The market leader was condemned to cover all bases. Now what's expected from a cultural leader reaches far beyond that.